From the end-user perspective, all of Archivematica’s functions take place within a web-based dashboard which can be accessed from anywhere by logging in through a web browser. The Dashboard is akin to a “processing space” for digital archives, allowing archivists to move packages of digital materials through the Archivematica pipeline before sending packages for storage or dissemination. A description of the Dashboard elements follows, with numbers referencing the image above. The Dashboard is divided into a number of tabs, with the grey area indicating the tab currently in view. Alerts appear in red circles when there is action required by the archivist in a tab. The names of the tabs (Transfer, Ingest, Archival storage, Preservation planning, Access, Administration) reference both the OAIS model, as well as sections of the user documentation. The user login name appears beside the tabs, and is where the user logs out from when processing work is complete. It is a good practice to “clean up” the Dashboard periodically by removing packages using the red “remove” button (see below). Archivematica’s processing is performed through a number of microservice. Microservices are provided by a combination of Archivematica Python scripts and one or more of the free, open-source software tools bundled in the Archivematica system. These microservice are broken down into a number of jobs, which users can see by clicking on the microservice to expand. Clicking on the gear icon within a job will open a new browser tab showing the tasks performed for that particular job. Certain microservice result in a decision point for the archivist. The decision is completed by choosing an available option from a drop-down menu. 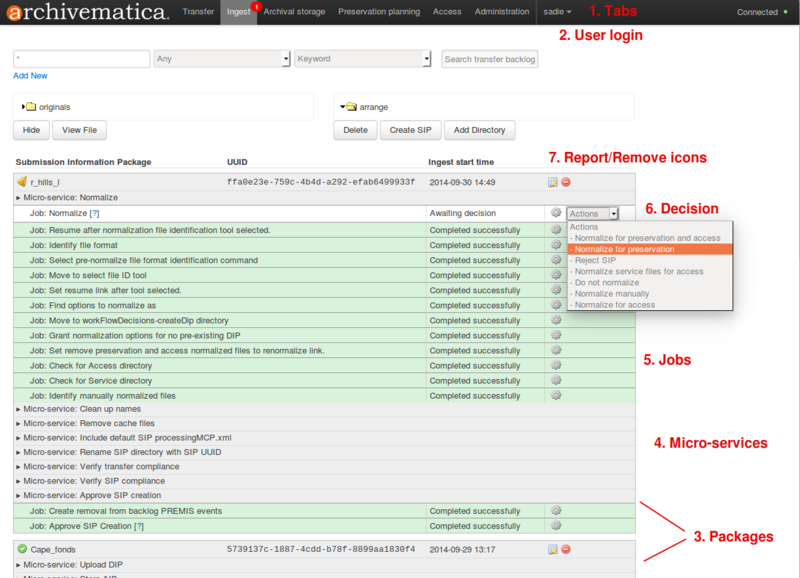 Many of the decision points can be pre-configured if desired in the Administration tab. Report (paper and pencil) icons appear on Transfer and Ingest packages and link the user to the descriptive and rights metadata entry page. (The same icon is used for forensic disk image transfer metadata entry as well as the normalization report). The red remove icon removes the package from the Dashboard. The package can be removed whether the processing is completed or not. It is best practice to remove completed packages periodically as a “cleanup” procedure to keep the web browser running smoothly. Note that removing a package does not delete the package or any AIPs or DIPs associated with it.